To Cork Street and the Flowers Gallery for a private view of Pointstar the new exhibition by Carol Robertson, which runs from 3rd May to 3rd June. 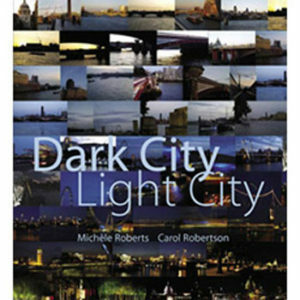 As a member of the London Society I first came across Ms Robertson as the author, with Michele Roberts, of Dark City Light City a book based on her photographs of London (Trace Editions, 2007). 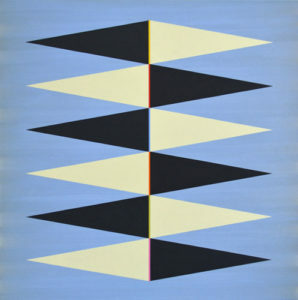 Since then I’ve seen her work at various intervals, always abstract, but very skilled in her use of colour, as she moved from her highly attractive stuttering horizontal colour scapes based on place, through curves of colour to her perfect circles. Now she has moved on again, to stars and triangles. 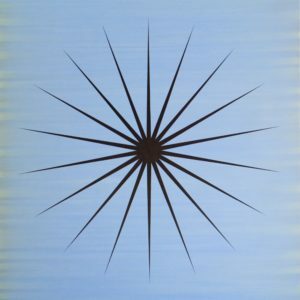 Pointstar includes works of varying sizes and colours, but mostly featuring very precise star shapes. Although entirely abstract these pictures have dynamism, they are highly suggestive of movement, either of revolution or movement out of, or into, the canvas. They also have a latent ferocity. As Sophie, a member of Flowers staff, remarked, these could be very angry shapes. Set Pointstar, above, along side Louise Bourgeois’ Maman, the giant spider. and we could have a nasty arachnoid fight on our hands. Colour tempers the fierceness in some and it’s interesting how this impacts upon the way the viewer reacts to the individual paintings. A single dot of orange at its centre somehow nullifies the animosity of a spiky star. A larger roundel suggests greater outward luminesence. 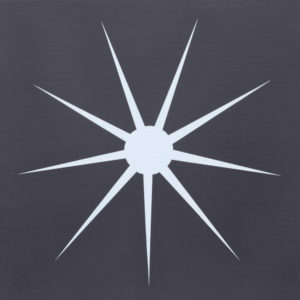 Size makes a difference too, the smaller works are more manageable, aesthetically ( as well as being more affordable, though this art is not within everyone’s reach, the small 8 inch square Pointstar, right, costs £1,500 ). 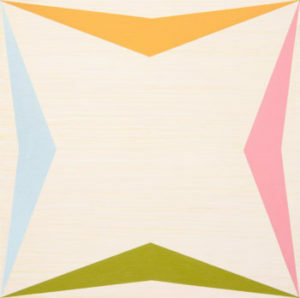 Although the majority of works in this exhibition are examinations of the star form, there are others, which explore triangles. I liked Quadrille, left, and its sister painting. No reproduction here can do justice to the vibrancy of the colours in this or any of the works. I also liked Ancestral Lines (below), with its quasi-heraldic and formal arrangement of sideways elongated triangles. Colour is used very cleverly therein, narrow lines of yellow and red along the shared base of the triangles (difficult to see in this image, I’m afraid ). Try visiting the artist’s web-site for a better view. You will also find a fairly comprehensive archive of her works from the horizontal city scapes onwards. The private view was busy, attended by friends of the artist but also Flowers regulars. I am more familiar with this gallery’s Kingsland Road premises, so a visit to Cork Street was a treat. The exhibition is mainly on the ground floor, with interesting sight lines through space, but there are excellent works by other artists in the basement gallery if you want to look. You can find out more on the Gallery’s web-site. The exhibition runs until 3rd June, see Flowers web-site for hours and opening.